Metal Gear Online Set Up Us The Bomb Mission! Konami's keeping the legion of Metal Gear Online fans in fresh content by announcing an all-new mission for the PlayStation 3 online tactical shooter. What is it? It's the Bomb Mission! Due to land on January 27th — no need to do anything regular Metal Gear Online players, it will coincide with regular maintenance — the new mode adds classic bomb defusing tactics to the online arm of Metal Gear Solid 4. Further details and screen shots from Metal Gear Online's new mode can be found in the official announcement after this. Konami announced today that an all-new mission for the hit online tactical shooter, Metal Gear Online, the online multi-player player experience that is included free in the retail version of Metal Gear Solid 4: Guns of the Patriots, will be available for download on January 27th. Free to all registered Metal Gear Online users, the Bomb Mission provides players with an all-new combat experience that expands the playability and adds variety to the online phenomenon. The new mission will automatically be implemented during the regular Metal Gear™ Online maintenance when players sign into their MGO accounts. In the new mission, the offensive team's objectives will be to detonate a bomb at a targeted location in the map and protect it until it explodes. 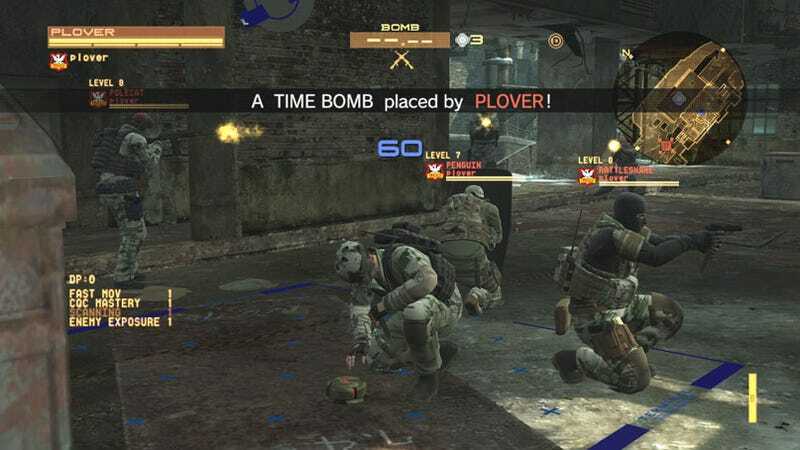 The defending team must protect its stronghold and prevent the planted bombs from detonating by using a special coolant to nullify an activated bomb and stop the attacking team from approaching the base. To complete the mission and come out victorious the attacking team must detonate the bomb within the mission time limit if they fail the defending team wins. For more information, please visit: www.konami.com.